Welcome to our week-long Christmas treats extravaganza! Our focus will be on chocolate, but we might sneak something else in as well. We hope you find plenty of inspiration for your holiday baking! I enjoy a good jam-filled thumbprint cookie. 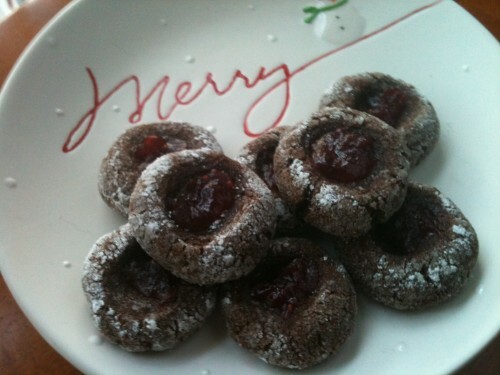 Last year I made lovely little butter thumbprint cookies. This year I was imagining a chocolate cookie base with a berry jam center. And what do I find in the December issue of Food Network Magazine? That's right, Cocoa Thumbprints! I tinkered with the recipe a bit to make them gluten-free. I cut-back on the sugar by a couple of Tablespoonfuls. And I used a slightly sweet, four-fruit jam as the center. Oh my, these are tasty! As usual, if you are not gluten-free, feel free to substitute all-purpose flour and omit the xanthan gum. In a medium bowl, whisk together the flour, scant 3/4 cup sugar, cocoa powder, baking powder, salt, and xanthan gum. Add the melted butter and eggs and stir until combined. Cover and refrigerate the dough until firm, about 30 minutes. Place the confectioner's sugar and the granulated sugar in two separate bowls. Roll scant Tablespoonfuls of dough into balls. Roll each in granulated sugar and then in confectioner's sugar. Place 1-inch apart on baking sheets. Make a deep indentation with thumb in each cookie. Place 1/2 teaspoon of jam in the indentation. Bake 10 to 12 minutes, or until the cookies are puffed and slightly cracked. Let cool 3 minutes on the baking sheet. Then transfer to a wire rack until completely cooled. of home made is totally different. especially your Lentil Pasta Soup so it will be one more to add to my wife's collection. I also note what a very informative site you maintain.